A perfectly poached egg is simple and yet one of the tastiest singular items you can have for breakfast, brunch, lunch or dinner. 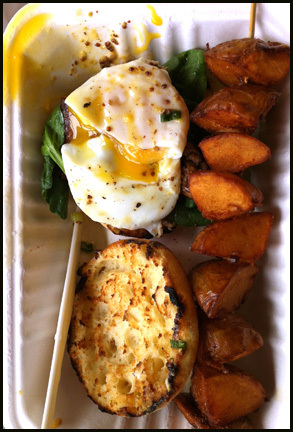 The folks at Yolk’s Breakfast food truck must share my love of poached eggs as it’s featured on almost everything on their menu. Being a natural klutz, my first encounter with a Yolk’s Breakfast sandwich did not go as well as it could. Since a well prepared poached egg has a runny yolk, I had yellow goo dripping everywhere on my work desk. It’s such a “problem” the staff will give you a wet wipe with your sandwich order. Upon a subsequent visit I incurred an unintended and unwelcomed dry cleaning bill. I feared that my relationship with Yolk’s Breakfast’s delicious food would have to come to end, until I realized I could just treat it like an open face sandwich and eat it with a fork and a knife. 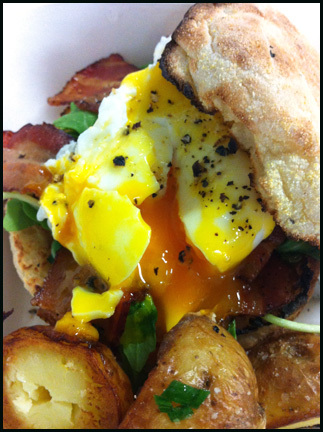 Of their regular single egg sandwiches served on an English muffin, I like their bacon option the best. Since I use utensils, I think of Yolks breakfast sandwiches more like eggs benny and as a result always ask for hollandaise sauce. As you can see the egg was poached perfectly with a spectacular orange fluid yolk. The bacon was salty and crispy. The arugula added a bitter and peppery kick to the sandwich. The good thing about using cutlery, besides being neat & tidy, you can use the top part of the English muffin to mop up the excess yolk & hollandaise sauce. Win-Win! Recently, I decided to try one of their specialty preparations: a crispy pork belly & free range egg sandwich with honey Dijon. Did I mention I was a klutz? The egg in the specialty sandwich was cooked well, unfortunately due some technical difficulties on my part, the yolk exploded and dripped outside of the take out box and into the plastic bag. That explains the sad deflated looking egg in the picture. The pork belly wasn’t crispy but it was tender and just plainly seasoned with salt. It was melt in your mouth good. The honey Dijon worked well with the pork. Spinach was included but it was more a garnish than a flavour contributor. I added a Truffle Lemon Hashbrown skewer to my order. You couldn’t mistake the smell truffle oil they use on the potatoes. The potatoes were crispy on the outside, soft on the inside and didn’t feel greasy. I could taste the truffle oil and salt but didn’t really taste the lemon component. 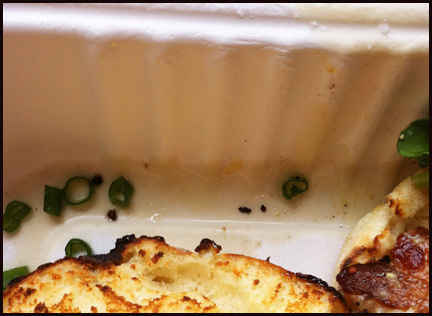 The only thing that bothers me is that occasionally small mysterious pools of oil appear in the take out container. Not 100% sure where the oil originates from. I think it’s from the hash browns. It just makes one think that the meal was heavy and greasy when in fact it’s not. It’s a presentation issue more than an execution problem. I really like the food offered by Yolk’s and look forward to trying the one item that doesn’t contain a poached egg, their Chicken and Waffles. 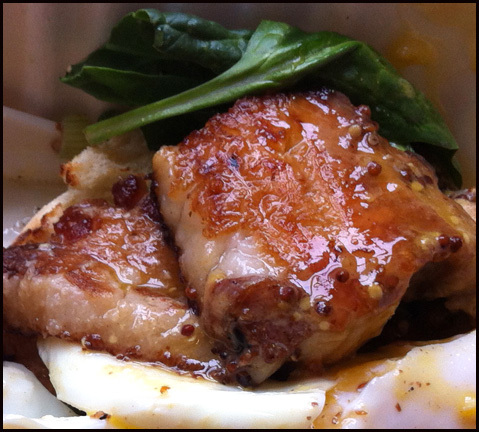 Since Yolk’s Breakfast is a food truck, it’s best to check their schedule & menu on their website (http://yolks.ca) and/or twitter account (@YolksBreakfast).